„ Tonight, we are honored and very proud that since our opening 25 years ago, our current Governor will be the first to visit the American Polish Cultural center. I might add that I am especially excited because this event is taking place here at the time while I am the President of this organization. There’s no doubt about it – Michigan is the Comeback State. With more than 300,000 new private sector jobs in only four years, Michigan is finally headed in the right direction. Instead of having to leave the state to find jobs, our kids can stay here to make their careers. Our cities are coming back, and there are exciting places to live and work. People all over the nation can tell that we’re the Comeback State in the United States. Four years ago, our spirit were down, and many of us thought that our best days were behind us. Today, I’m proud to call myself a Michigander, and I can’t wait to see what’s in store for the future. 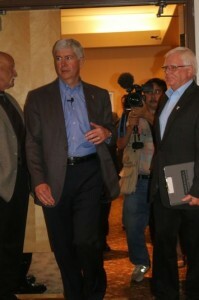 We are on the Road to Recovery with Governor Snyder.